Have you seen John McCain's latest ad? "Celebrities don't have to worry about family budgets, but we sure do," the announcer says. "We're paying more for food and gas, making it harder to save for college, retirement. Obama's solution? Higher taxes, called 'a recipe for economic disaster.' "
"He's ready to raise your taxes, but not ready to lead," the announcer concludes. That's right, Obama is going to raise your taxes, but only if your family income is greater than $603,403, ie you're among the top 1% of American households. 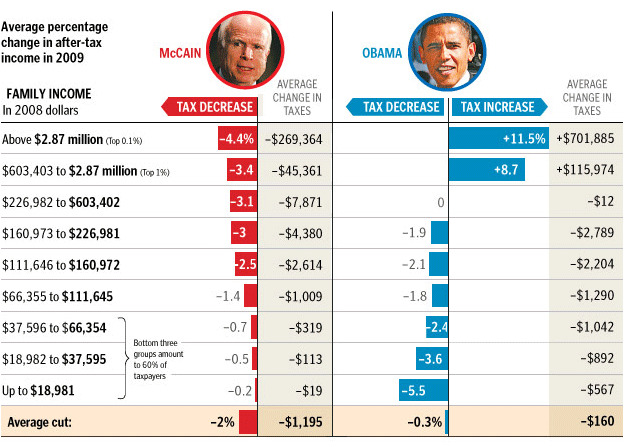 If your family income is less than $111,645, your taxes will be cut more by Obama than they would be by McCain. Click here for The Washington Post story, "Obama and McCain Tax Proposals"
Apparently these rules don't apply to political ads.